Aston Villa Training Pants Navy. 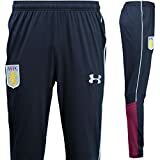 The Aston Villa Training Pants are made from a smooth, stretch-woven fabric thatвs ultra-lightweight which lets you move easily.В They feature the Under Armour Moisture Transport System that wicks sweat & dries fast, enabling you to continue with your sports or training. The training pants are designed with an encased elastic waistband and internal draw cord which allow them to fit tailored to you. This entry was posted in Soccer and tagged Armour, Aston, Football, Gents, Mens, Navy, Pants, Soccer, Training, Under, Villa by FPSports. Bookmark the permalink.